bookmarked for when it re-opens in the Fall and, in the meantime, check out the FAQs. Read on! I am a rising third year studying software engineering at the University of California, Irvine (UCI). I am very passionate about leadership, personal development, and community outreach. During my sophomore year, I served as Vice President of Outreach for the UCI Chapter of the Society of Hispanic Professional Engineers (SHPE). As a result, I was able to attend Google’s Hispanic Student Leadership Summit two years in a row. This upcoming year, I will be the student head of a planning committee for a regional SHPE conference for hundreds of SHPE members. For over a year I’ve also been doing research in databases and distributed systems in a software engineering lab at UCI. As a hobby, I love creating things through various art mediums such as painting, drawing, writing, sewing, and photography. I am always seeking opportunities to create new abstract projects! I am an Engineering Practicum Intern for the Node Storage Team, which is a part of Technical Infrastructure. My work is centered around the Linux Operating System Kernel used at all of Google’s Data Centers. I love my work because it is very complex and every day I am learning something new! I create for a future where everyone has the opportunity to learn, develop, and prosper. I love to come to work every day because my work is impactful and my team is amazing! I am very fortunate that my project will be making a real difference at Google. Although I’ll admit my project is a bit intimidating, my hosts and teammates are always more than happy to help. I love talking to my teammates at lunch and around the office, especially because they all embrace my nerdy weirdness! There are a lot of reasons why people would want to work at Google – the complex problems, the benefits, the pay, the work-life balance, the list goes on and on. That being said, I’ve always wanted to become a Googler because of Google’s culture and values, which aim to create positive change in the world. During my freshman year of college, I found out about Google’s Engineering Practicum Internship (which is specifically for standing 1st and 2nd-year college students) and thought it was a perfect way to start a career as a Googler. Although I found out about the internship too late to apply my freshman year, I knew I wanted to apply during my second year. I felt confident in my application because I used the prompts to express my passions and because I had developed significant professional/technical skills during my first year of college, however, the thought that thousands of people were applying for the same internship scared me a little. Nevertheless, throughout the interview process I was determined to show how Googly I am. I am very grateful to have had the opportunity to interview and especially to receive an offer. My recruitment process was, unique, to say the least. I was referred to apply by my mentor, the software engineering PhD student who I do research with, and my application process was very smooth. My interview process wasn't as smooth as I expected, which had me pretty worried that I wouldn't make it! My recruiter helped navigate the issues I had, and it all worked out in the end because I was given an offer. I wish I would have started preparing for the technical interviews way earlier. In about a month and a half I prepared by learning about algorithms and data structures, doing practice problems on a whiteboard, and participating in mock interviews. Although I was able to cover a lot of content, there were a lot of sleepless nights involved. In hindsight, I should have used the summer to prepare rather than squeezing it in during the fall quarter. Can you tell us about the resources you used to prep? To prepare for the technical interviews I watched a ton of videos. YouTube is a great way to learn about data structures and algorithms and to find practice problems. @GoogleStudents YouTube channel has a number of videos on technical questions that I watched. Google is looking for people that have a wide variety of skills and experiences, but sometimes gaining those skills are hard and/or will make you uncomfortable, but only because you haven’t done them enough! Join clubs/programs that interest you, become a leader, build projects, do research, learn a new language – the possibilities are endless you just need to be hungry enough to take them. Whether you are studying Software Engineering, Business, Mechanical Engineering, Psychology, Teaching, or anything in between/outside there is a pretty good chance that Google needs someone like you! Life is hard, and sometimes things don’t go as planned, but never ever give up on accomplishing your dreams. The most passionate and successful Googlers that I personally know come from tough backgrounds! The following are all true: Google is a huge company, a ton of people apply, very few people get in, you can do anything you put your mind to, applying to Google can be intimidating but it is far from impossible, you can do it. 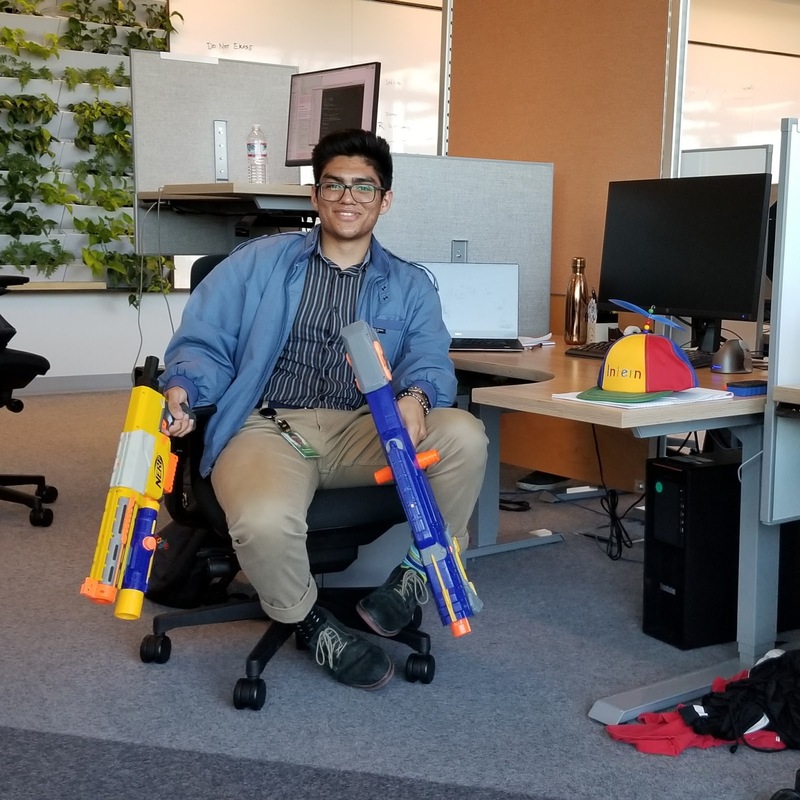 Welcome to the 29th installment of our blog series “My Path to Google.” These are real stories from Googlers, interns, and alumni highlighting how they got to Google, what their roles are like, and even some tips on how to prepare for interviews. To celebrate the upcoming #NationalInternDay, today’s post is all about one of our Engineering Practicum Interns, Robert Maldonado. Engineering Practicum is a 12-week internship for first and second-year undergraduate students with a passion for computer science. Keep our Engineering Practicum job listing bookmarked for when it re-opens in the Fall and, in the meantime, check out the FAQs. Read on!